The Norfolk (VA) Chapter of Links Inc. recently sponsored its 3rd Annual A. B. Jackson Scholarship Ceremony at the James Wise Gallery in the E.L. Hamm Fine Arts Building on the campus of Norfolk State University. In 1971, The Norfolk (VA) Chapter of the Links, Incorporated hosted the first exhibition of A.B. Jackson’s artwork at Norfolk State University. As a result, community members generously gave their financial support and the A.B. 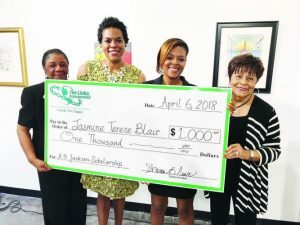 Jackson Fine Arts Scholarship was established at Norfolk State University. The late A.B. Jackson taught art 10 years at Norfolk State University, and then joined ODU as a full professor, becoming its first African-American faculty member. Jackson also exhibited his art in shows in many local and neighboring areas. Jackson received significant attention in 1968, after several of his drawings were included in a Smithsonian Institution traveling art exhibition. Jackson died in 1981, at the age of 55. Today, he is represented in the permanent collections of museums across the country. This year’s $1000 fine arts scholarship recipient was rising senior, Jasmine Blair. The event featured an exhibition of artwork created by the scholarship recipient, a reception, and live music by the NSU Jazz Ensemble.